The Party Pardee is a fun ride through the rolling foothills of Amador and Calaveras Counties near the gold rush town of Ione. Youll find well stocked rest stops and friendly volunteers to greet and refuel you along your tour. At the end of the ride youll enjoy a delicious after-ride meal and live music by Mumbo Gumbo! 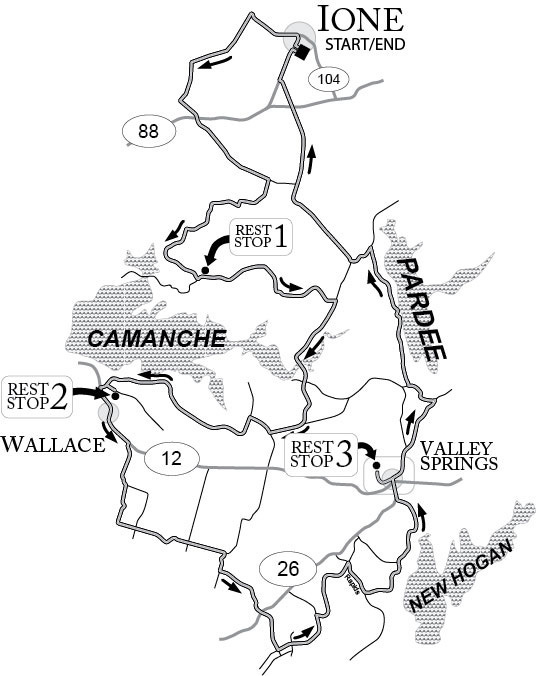 The 100K route will take you through the quiet country around Ione, passing Lake Camanche and Pardee Reservoir, through quiet little towns like Buena Vista, Campo Seco, and Valley Springs. The route will provide a challenge for most riders with plenty of “rollers” through the green wooded foothills in all their spring glory. There is approximately 4150′ of climbing on the 100K route. How was Party Pardee Metric Century Ride?